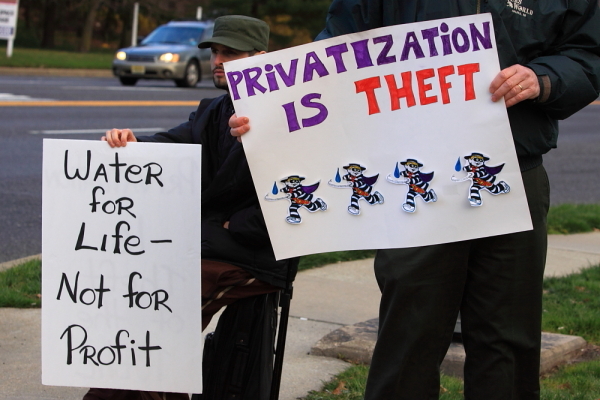 The Article: 8 Ways Privatization Has Failed America by Paul Buchheit in The Contributor. The Text: Some of America’s leading news analysts are beginning to recognize the fallacy of the “free market.” Said Ted Koppel, “We are privatizing ourselves into one disaster after another.” Fareed Zakaria admitted, “I am a big fan of the free market…But precisely because it is so powerful, in places where it doesn’t work well, it can cause huge distortions.” They’re right. A little analysis reveals that privatization doesn’t seem to work in any of the areas vital to the American public. Our private health care system is by far the most expensive system in the developed world. Forty-two percent of sick Americans skipped doctor’s visits and/or medication purchases in 2011 because of excessive costs. The price of common surgeries is anywhere from three to ten times higher in the U.S. than in Great Britain, Canada, France, or Germany. Some of the documented tales: a $15,000 charge for lab tests for which a Medicare patient would have paid a few hundred dollars; an $8,000 special stress test for which Medicare would have paid $554; and a $60,000 gall bladder operation, which was covered for $2,000 under a private policy. As the examples begin to make clear, Medicare is more cost-effective. According to the Council for Affordable Health Insurance, Medicare administrative costs are about one-third that of private health insurance. More importantly, our ageing population has been staying healthy. While as a nation we have a shorter life expectancy than almost all other developed countries, Americans covered by Medicare INCREASED their life expectancy by 3.5 years from the 1960s to the turn of the century. Free-market health care has been taking care of the CEOs. Ronald DePinho, president of MD Anderson Cancer Center in Texas, made $1,845,000 in 2012. That’s over ten times as much as the $170,000 made by the federal Medicare Administrator in 2010. Stephen J. Hemsley, the CEO of United Health Group, made three hundred times as much, with most of his $48 million coming from stock gains. Numerous examples of water privatization abuses or failures have been documented in California, Georgia, Illinois, Indiana, New Jersey, Texas, Massachusetts, Rhode Island — just about anywhere it’s been tried. Meanwhile, corporations have been making outrageous profits on a commodity that should be almost free. Nestle buys water for about 1/100 of a penny per gallon, and sells it back for ten dollars. Their bottled water is not much different from tap water. Bloomberg notes that deregulators in the 1990s anticipated a market-based decline in phone and cable bills, an “invisible hand” that would steer competing companies to lower prices for all of us. Verizon and AT&T and Comcast and Time-Warner haven’t let it happen. As Republicans continue to deride public transportation as ‘socialist’ and ‘Soviet-style,’ China surges ahead with a plan to create the world’s most advanced high-speed rail transport network. Government-run high-speed rail systems have been successful in numerous other countries, and England and Brazil both lament industry privatization. As a warning to wannabe Post Office privatizers, Greyhound and Trailways once provided service to remote locations in America, but deregulation intervened. The bus companies eliminated unprofitable routes, and cutbacks and salary decreases, all in the name of optimal profits, resulted in drivers working up to 100 hours a week — a fact to consider any time each of us ride the bus. The industry is bloated with deceit and depravity. Almost all of the big names have taken part. Goldman Sachs designed mortgage packages to lose money for everyone except Goldman. Countrywide and Wells Fargo targeted Blacks and Hispanics for unaffordable subprime loans. HSBC Bank laundered money for Mexican drug cartels. GE Capital skimmed billions of dollars from its customers. Dozens of hedge fund managers have been guilty of insider trading. Bank of America and JP Morgan Chase hid billions of dollars of bonuses and losses and loans from investors. Banks fixed interest rates in the LIBOR scandal. They illegally foreclosed on millions of homeowners in the robo-signing scandal. Matt Taibbi explained to us how financial malfeasance led to the bubbles in dot-com stocks and housing and oil prices and commodities that extract trillions of dollars away from society. This is all the result of free-market deregulated private business. The best-known public bank, on the other hand, is the Bank of North Dakota, which remains profitable while serving small business and the public at low cost relative to the financial industry. One would think it a worthy goal to rehabilitate prisoners and gradually empty the jails. But business is too good. With each prisoner generating up to $40,000 a year in revenue, it has apparently made economic sense to put over two million people behind bars. The need to fill privatized prisons has contributed to mass jailings for drug offenses, with African Americans, who make up 13 percent of the population, accounting for 53.5 percent of all persons who entered prison because of a drug conviction. Yet marijuana usage rates are about the same for Blacks and whites. Studies show that private prisons perform poorly in numerous ways: prevention of intra-prison violence, jail conditions, rehabilitation efforts. Investigations in Ohio and New Jersey revealed a familiar pattern of money-saving cutbacks and worsening conditions. The notion that charter schools outperform traditional public schools is not supported by the facts. An updated 2013 Stanford University CREDO study concluded that privatized schools were slightly better in reading and slightly worse in math, with little difference overall. Charter results have shown an improvement since 2009. Just as with prisons and hospitals, cost-saving business strategies apply to the privatization of our children’s education. Charter school teachers have fewer years of experience and a higher turnover rate. Non-teacher positions have insufficient retirement plans and health insurance, and much lower pay. If big money has its way, our children may become high-tech symbols and objects. Bill Gates proposes quality control for the student assembly line, with video footage from the classrooms sent to evaluators to check off teaching skills. Warning signs about unregulated privatization are becoming clearer and more deadly. The Texas fertilizer plant, where 14 people were killed in an explosion and fire, was last inspected by the Occupational Safety and Health Administration (OSHA) over 25 years ago. The U.S. Forest Service, stunned by the Prescott, Arizona fire that killed 19, was forced by the sequester to cut 500 firefighters. The rail disaster in Lac-Megantic, Quebec followed deregulation of Canadian railways. Regulation is meant to protect all of us, but anti-government activists have worked hard to turn us against our own best interests. Among recommended Republican cuts is the Federal Emergency Management Agency (FEMA), which rescued hundreds of people after Hurricane Sandy while serving millions more with meals and water. In another ominous note for the future, the House passed the Clean Water Cooperative Federalism Act of 2011, which would deny the Environmental Protection Agency the right to enforce the Clean Water Act. Deregulation not only deprives Americans of protection, but it also endangers us with the persistent threat of corporate misconduct. As late as 2004 Monsanto had insisted that Agent Orange “is not the cause of serious long-term health effects.” Dow Chemical, the co-manufacturer of Agent Orange, blamed the government. Halliburton pleaded guilty to destroying evidence after the Gulf of Mexico oil spill in 2010. Cleanups cost much more than the fines imposed on offending companies, as government costs can run into the billions, or even tens of billions, of dollars. As summed up by US News, “Private industry is not going to step in and save people from drowning, or help them rebuild their homes without a solid profit.” In order to stay afloat as a nation we need each other, not savvy businesspeople who presume to tell us all how to be rich. We can’t all be rich. We just want to keep from drowning.